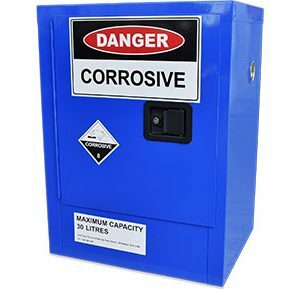 450 Litre Outdoor Dangerous Goods cabinet. Constructed with Heavy duty galvanised steel. 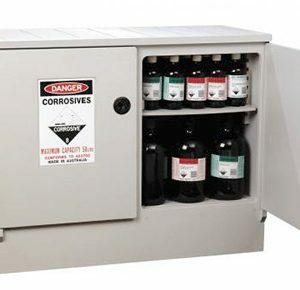 The 450L cabinet includes 3 shelves (1 fixed base shelf and 2 adjustable shelves). Two 270 degree opening doors for ease of loading/unloading contents. Features a rear-sloping roof and gutter to reduce admission of rainwater. Ventilated in accordance with Australian Standards. Built-in spill containment bund, including an externally accessible drain to easily decant sump. ISO locking bar for providing extra security and strength. 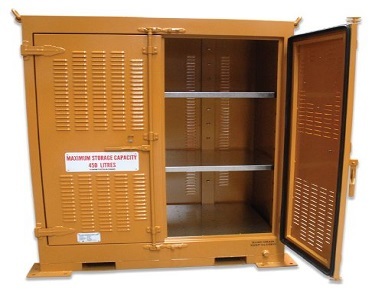 Built in forklift tyne slots make the cabinet easily transportable (will fit the majority of standard fork tynes). 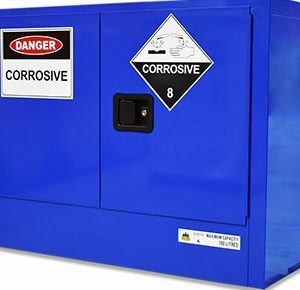 Features a high build 2 pack epoxy primer and semi-gloss 2 pack polyurethane yellow top coat (dry film of 200 microns in accordance with AS 2312.1-2014). 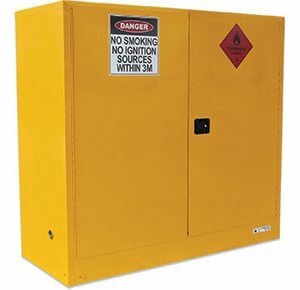 Includes safety and warning signage according to the goods to be stored (purpose of cabinet to be confirmed prior to build). An earth lug and earth stake is provided for instillation on site. 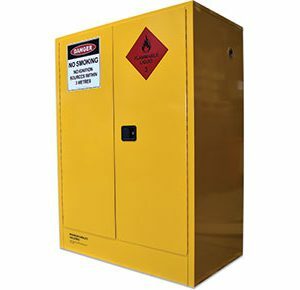 Our purpose built outdoor dangerous goods storage cabinets offer superior quality and longevity in comparison to other market alternatives. 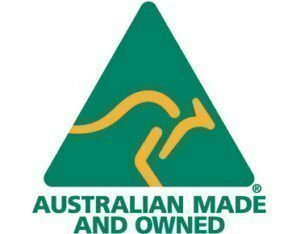 Made in Australia, to meet Australian standards and conditions.